President Roosevelt is said to admire men who “do things.” We feel sure that had he had the opportunity of knowing the subject of this article, he would, for that reason, be well impressed with him. A doughty pioneer, an intrepid Indian fighter, a sociable and generous man, a patriotic citizen, Mr. Beeman is one among a thousand and a brief review of his intensely interesting career will be profitable and interesting reading for the history of Nez Perces County. Rufus H. Beeman was born in McKean, Pennsylvania, on August 3, 1832. 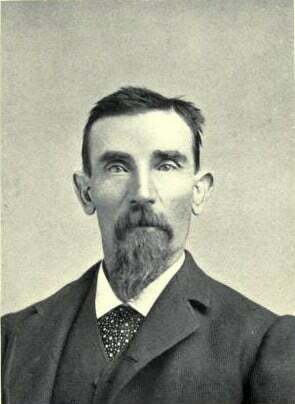 His father was a lumberman and a native of Connecticut, and his family had been residents of New England for many generations. The mother of our subject was a native of Pennsylvania, and three years after the death of Mr. Beeman she married Mr. McIntosh, a native of Scotland. Shortly after this, the family removed to Potosi, Wisconsin, and there Mr. McIntosh mined and later discovered a very valuable lead mine. When twelve, Rufus left home and resided with Mr. Parker, a miner, where he attended school a part of each year and worked in the mines the balance of the time for six years. In 1852 he came to the Cascades, Oregon, herded cattle, cleared land and boated on the Columbia. In 1854, we see him in Roseburg and from then until 1861, he had a freight train from there to Jacksonville, Oregon. During the Rogue River Indian war in 1855 and 1856, he fought the savages and participated in the battle of Hungry Hill, said to be the bloodiest battle ever fought on the coast. He was about to be killed, while assisting a wounded comrade, but managed to escape without a scratch. He was in Company C, Ninth Regiment, under Captain Rynearson and Colonel John E. Ross. He came to Walla Walla in 1861 and there freighted and farmed until 1872. In 1874 Mr. Beeman removed to Genesee valley and bought five hundred and sixty acres of land. He cultivated it to the cereals and while there ran for sheriff and was defeated by one vote. Seventeen years were spent there and part of that time he operated a general store, but while trade was good his collections were poor and therefore he was obliged to withdraw from the field. He then bought a half section in the Potlach country near Juliaetta and about a year before the opening of the reservation, he sold it and bought cattle. When the reservation opened he came hither and rented land from the Indians, one section in one place and two hundred and forty acres in Garden Gulch. His daughter, Clara B., filed on a quarter and that with other rented land, was cultivated to oats and flax, having nearly five hundred acres all told. Mr. Beeman is one of the largest farmers in this portion of the County and is abundantly prospered. On February 19, 1856, at Roseburgh, Oregon. Mr. Beeman named Miss Caroline, daughter of Levi and Elizabeth (Ream) McBee, natives of Ohio and Maryland, respectively; both died while crossing the plains in 1852. Mrs. Beeman was born in Missouri, on February 19, 1842, was with relatives at the Cascades, Oregon, for a time and then lived with E. F. McNall at Roseburg until she was married. She has one brother, Isaiah, a blacksmith and farmer, near Goldendale, Washington. Mr. Beeman has one sister, Sarah, wife of Abraham Anderson, in Lafayete, Pennsylvania. Mrs. Beeman also has two sisters, Barbara A., wife of Edward Chambreau, at Portland; Rebecca, wife of Isaac Knighton, a farmer in Morrow County, Oregon. To Mr. and Mrs. Beeman, twelve children have been born, named as follows: Henry, in Wallowa County, Oregon; Francis M., a herder, in Okanogan County, Washington; Frederick S., William Charles, all stockmen in the same place; Egbert, at home; Leroy, also at home; Mary E., wife of Joseph Henry, a freighter, near Milton, Oregon; Rosella, wife of Lewis Taber, a farmer near Ellensburg, Washington; Lura, wife of Jack Johnson, a farmer in Okanogan County; Adelia, at home; Anna, born August 5, 1864 and died October 16, 1883, and was the wife of Albert Fansler, a native of Virginia, and she left one child, Iris, who died aged fourteen; Arabelle A., died June 22, 1896, aged twenty-three years, three months and two days. Mr. Beeman was an active Democrat in earlier days, but is not so much so now. He is a respected and prominent man in this community. NextSampson, Charles C. to Swenson, Swen I.